By surveying the seabed with state-of-the-art mapping technology, geologists reconstructed most of the submerged landscape in great detail. Hidden under the sea is a landscape filled with valleys, caverns and sinkholes that helped map out Malta’s ancient history where Sikka l-Bajda reef used to be an island more than 115,000 years ago. 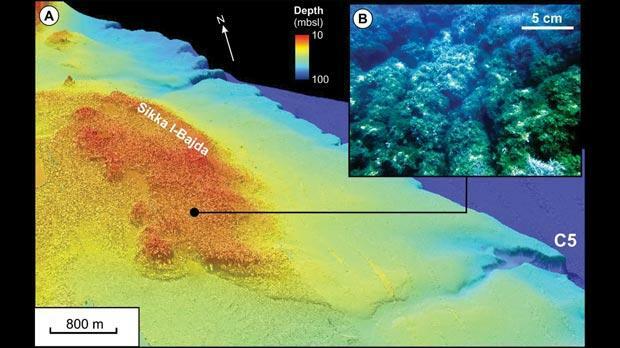 At that time, Malta, Gozo and Comino were connected and Bengħajsa reef was a peninsula, a study carried out by marine geologist Aaron Micallef has revealed. The study, recently published in prestigious magazine Marine Geology, was jointly carried out with other foreign researchers and forms part of the Mapscape project, a collaboration between a number of Italian universities and research institutions with the University of Malta. By surveying the seabed with state-of-the-art mapping technology, the international team of geologists reconstructed most of this submerged landscape in great detail. About 20,000 years ago, the coastline from Marsalforn to Pembroke consisted of steep coastal cliffs incised by more than 20 valleys. Numerous limestone plateaus had collapsed caves and landslides along their margins. A 40-kilometre-wide land bridge connected southeast Malta all the way to the south of Sicily. Since then, the rise in sea level has drowned more than 450 square kilometres of this landscape, meaning that the largest part is under water. The highest elevation of the Maltese Islands was 340 metres above sea level almost 30,000 years ago. The sea level continued to drop irregularly until 20,000 years ago when these were exposed the most and the entire archipelago was connected. The data “revealed an exceptionally well-preserved” landscape offshore on the northern, eastern and southern coasts. Among other things, the study can be used to understand how coastal regions evolved to sea level change in the past and will help predict how they will respond to change associated with climate change. Submerged caves and valleys could provide ideal sites for preserving evidence of pre-historic human occupation or animal activity.